OK, after a year of shooting with my Canon 40D which I completely love, I just received my Canon 50D today!!! Canon’s new EOS 50D bridges the gap between the novice and the seasoned pro with a perfect combination of high-speed and quality. It features an APS-C sized 15.1-megapixel CMOS sensor for tremendous images, new DIGIC 4 Image Processor for fine detail and superior color reproduction, and improved ISO capabilities up to 12800 for uncompromised shooting even in the dimmest situations. It features a refined 3.0-inch Clear View LCD (920,000 dots) monitor, supercharged Live View Function with Face Detection Live mode, plus a number of new automatic Image Correction settings and HDMI output for viewing images on an HDTV. Pick up the EOS 50D and you’ll experience true digital inspiration! The EOS 50D features a newly-designed 15.1-megapixel APS-C sized CMOS sensor which is capable of recording up to 4752 x 3168 pixels with full 14-bit A/D conversion for extremely fine tonal gradation. Ready to capture images in an instant, the sensor is designed to work with Canon’s EF and EF-S lenses with a conversion factor of 1.6x. It’s capable of recording at sensitivities previously too noisy for shooting in low light or subjects in motion. With a maximum ISO rating of 12800 combined with a 4-level High ISO speed noise reduction function, images that would have been impossible without the use of a strobe or flash become simple to record. The EOS 50D operates with such effortless speed that operation is nothing short of intuitive. With instant startup times, speedy autofocus and minimal shutter lag, the EOS 50D is one of the fastest cameras available today. It can shoot up to 6.3 fps, in bursts of up to 90 JPEGs (using an UDMA CF card), 60 JPEGs (using a CF card) consecutively or 16 RAW files, so you’ll never, ever miss a shot. This next generation DIGIC 4 Image Processor offers finer details and even more natural color reproduction, compared with the previous DIGIC III Image Processor. Since Canon’s DIGIC 4 chips use advanced signal processing technologies, they provide even faster operations, including write times to UDMA cards. It also enables Face Detection Live mode to detect and focus up to 35 face(s) to capture the best possible shot. Further, DIGIC 4 offers the improved Auto Lighting Optimizer that corrects brightness and contrast automatically, and Peripheral Illumination Correction for up to 40 EF lenses. DIGIC always maximizes performance between the capturing and recording stages of digital photography. 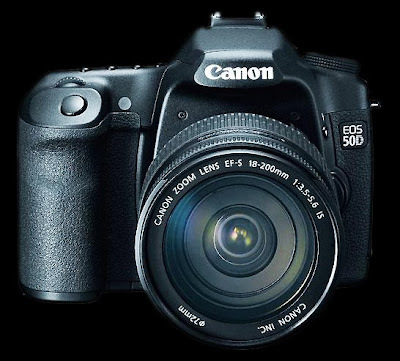 The EOS 50D features a bright, high resolution, 3.0-inch Clear View LCD monitor with 920,000 (dots/VGA) pixels and a broad viewing angle of 160 degrees horizontally and vertically. It offers a brighter and more detailed display than the EOS 40D, includes a new smudge-resistant coating, and is perfect for accessing camera settings like ISO, Metering modes AF Point selection and flash options. Plus, it’s superb for reviewing, editing and deleting photos or composing new images in Live View Function. The EOS 50D features Canon’s most advanced Live View shooting thanks to the number of focusing modes available including Quick mode, Live mode and Face Detection Live mode. You can zoom in and navigate the composition 5x or 10x normal size, enabling critical focus. There’s even 2 overlay grid options, perfect for lining up vertical and horizontal lines. In the studio, the camera can be controlled remotely with Live View Function when the camera is connected to a computer through a USB cable, or wirelessly if the optional Wireless File Transmitter WFT-E3A is used. Canon’s exclusive Lens Peripheral Illumination setting takes into account any light falloff in the corners of the frame and corrects it, making for a perfectly exposed image. Correction data are detected automatically on a number of Canon EF lenses and can be entered manually through included the Canon EOS Utility software. The EOS 50D’s Self Cleaning Sensor Unit eliminates stray dust that enters the camera when changing a lens or when out in the field. The sensor’s IR-cut/Low-pass filter cleans itself automatically with ultrasonic vibrations every time the camera is turned on or off and features a new flourine coating to minimize dust adhesion. Dust missed by the cleaning unit is captured by Canon’s Dust Delete Data Detection software and can be erased from the image file. Dust that may still remain on the front of the sensor can also be erased with software included in Digital Photo Professional (DPP) Version 3.3 or later software. A simple test shot of a plain, white object can be taken, using a menu setting. This Dust Delete Data image is analyzed in-camera, and the location and size of any remaining dust is added to any subsequent pictures taken. This data is transmitted along with the image, whether JPEG or RAW, and can be either manually or automatically erased in Canon’s DPP software. This added software option ensures the cleanest possible image, perfect for printing or archiving. The EOS 50D has a new Creative Auto mode and a quick control screen that helps novice users narrow the gap between fully automatic and manual control. While the camera will remain by default in fully automatic mode, frequently changed settings like flash, exposure compensation, image quality and more are all accessible through one easy screen interface designed for intuitive, quick action. A provided shooting guide serves as a quick-reference for on-the-fly operation. The EOS 50D includes a new HDMI (High Definition Multimedia Interface) output device that enables High Definition display of your photographs on any HDTV with HDMI ports. It’s remarkable to behold the details of your photographs in Full HD, and it’s easy with the EOS 50D. Resolution is set automatically to match the TV to which you’ve connected, and images are displayed in a full-frame 3:2 ratio with blacked out bars to the left and right of the image. These specs are a major improvement over the 40D and give you a 50% increase in pixels with much lower noise. The ISO can be set at 12,800. Yes, 12 Thousand 8 Hundred!! The camera for what you get is probably the best deal around right now as it sells on Amazon for $1371.00. The 40D is still a great camera and the prices have been lowered on it. For those wanting more in the way of full frame check out the soon to be available (only a few weeks away) Canon 5D Mark 2 at 21 Mega Pixels Full Frame for only $3200.00. I will be shooting hopefully this week and will post some prints and a review of my own then.